students display their first prototype of an LED safety vest. Tracey Wong had heard about students creating 3-D printed prosthetic hands at their libraries for kids in need, and she wanted to do a similar tech project with her elementary students. Thinking that the 3-D hands would be too complex for second and third graders, she got the idea to design prosthetic limbs for local animals, a project she thought her young students could connect to emotionally. Wong pitched the pet prosthetics idea for Dremel’s #LearnMakeGive contest, focused on inventions that solve a community problem, and won two 3-D printers for her school library. That set in motion a rewarding prototyping exercise for 18 students at Greenburgh (NY) Central School District. Figuring out how to design the prosthetics on Tinkercad was tricky, but the students persevered. The kids met for 20 minutes twice a week over four and a half months. Designing prototypes, “they had to think about proportions—they were doing the math and had to consider solutions for small, medium, and large dogs,” says Wong. She identified a canine candidate from the local firehouse who had lost a limb and another whose back legs did not function. “The kids had to consider the animals’ comfort and mobility. They were very compassionate,” she says. Thinking through designs, one student suggested a prosthetic have a ball joint; another proposed a wheel or round ball at the base. For the dog whose back legs did not function, a student proposed a two-wheeled structure, essentially a wheelchair for hind legs. A veterinarian provided feedback on the kids’ ideas. While they had imagined a way to adhere the artificial limbs, he demonstrated how prosthetics could attach to a harness. 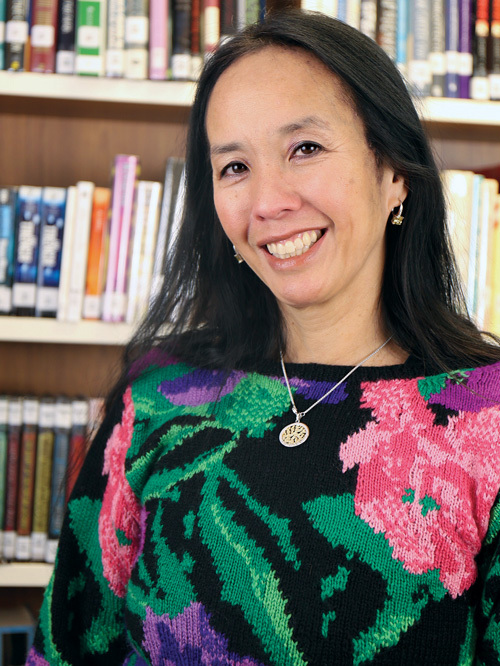 Wong took a new position as library media specialist at Blind Brook Middle and High School in Tarrytown, NY, before any animals benefited from the kids’ inventions. But she is eager to re-create the challenge in the future. Currently, Wong is spending her Saturdays working with a team of girls from Maria Regina High School in Hartsdale, NY, to develop LED safety vests. Applying for a Lemelson–MIT InvenTeam award, which calls for technological solutions to real-world problems, Wong asked her school tech director to identify issues facing Greenburgh, a community with mostly Title I schools. He pointed to traffic dangers and safety among pedestrians, runners, and children and suggested that LED jackets with safety messages would help. The team won a $10,000 grant and started working toward a June presentation date. The “process is a little complicated, because the girls don’t have a coding background,” says Wong. The idea is to allow wearers to program the LED message from their smartphones so that phrases such as “RUNNER,” “SLOW DOWN,” and “KIDS AT PLAY” display. The team is figuring out how to program the tool to block profanity. Technical challenges have included electrical shorts on the LED panels and the text not displaying correctly. Initially the group designed garments with boards attached. Now they are developing panels that can be worn over clothing by anyone, including municipal workers. Ideally, they will operate on solar power. “Ultimately it will help not only the girls, but the community,” says Wong.